Per shelter, this dog is: CODE RED - in imminent need for rescue and in danger of being euthanized if not picked up by a rescue. I am a male, white and tan Chihuahua - Smooth Coated mix. I have been at the shelter since May 31, 2018.
the shelter wants to take his Happy away! NOT RESERVED - BAMBINO WILL BE KILLED SHORTLY at Riverside County Animal Control - Riverside Shelter, a shelter notorious for its high kill rate, is not the place where hope abounds to say and write the least. 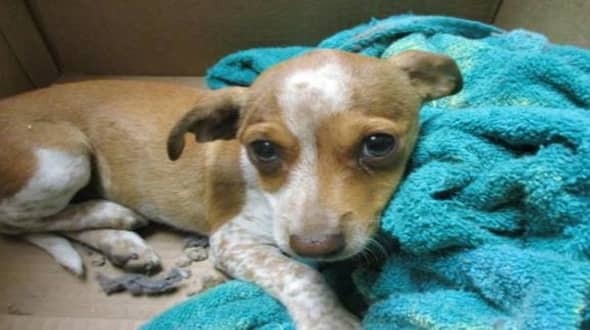 4 Responses to "10 weeks old Chihuahua in imminent need for help and in danger of being euthanized if not picked"
If you really want to save a life do not wait to call. I really want this dog!!!! She fits our family perfectly!!! Where can I find a dog transport? I live in Lafayette, IN!!! !